Over the years, many extraordinary pieces of video footage have surfaced in connection with the UFO mystery. One of the most remarkable of all first appeared in a documentary in 1997. The video purported to show an alien being interrogated by US military personnel. But was it real or just another fake, like the Alien Autopsy film which was making headlines around the same time? The video shows a typical alien Grey, with a small body, bulbous head and large, black, insect-like eyes seated at a table in a darkened room. On the table is a variety of monitoring equipment. A few humans can be seen on the other side of the table. One of these is supposedly a military telepath, communicating with the alien telepathically. The alien’s head bobs around a little as the interrogation continues but there is no obvious movement of its mouth. As the questioning proceeds, the alien becomes more agitated. Its head begins to move spasmodically. Some of the monitoring equipment on the table reacts. Something is clearly wrong. Technicians dressed in medical gear rush into the room and tend to the distressed alien, examining it under bright lights. Before we can see whether the alien lives or dies, the tape ends. Throughout, the video has no sound. Where did the Alien Interrogation Video Come From? The story of the alien interrogation tape is shrouded in mystery. It surfaced in the documentary “Area 51 : the Alien Interview” produced by the California company, Rocket Productions. Though the documentary is one hour long, the actual footage of the interrogation lasts for only 3 minutes. The film had been brought to the company by a man known only as “Victor”. Victor will not reveal his real name, he says, for fear of assassination. Though he speaks on the documentary, his voice is deliberately distorted so as to be unrecognisable. 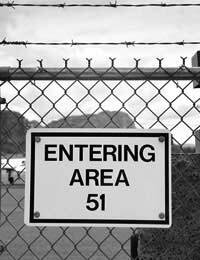 Victor claimed that he worked as a technician in Area 51, the super-secret military base in Nevada. He says he came across the tape one day while transferring the contents of video tapes to a digital format. Secretly, he made a copy of the tape for himself and smuggled it out of the base. Victor claims the original had an audio track but that he himself had removed it to safeguard the identity of the military personnel. Is the Alien Interview Real or Fake? Victor claimed to find the last moments of the film, featuring the ailing alien, difficult to watch. One ufologist who was invited to a pre-screening of the film reportedly broke down in tears at the end. Others in the UFO community have been profoundly moved by the tape, angered at the agonies apparently inflicted on the hapless alien. But is the tape authentic? Sceptics point to the darkened room. Why is it so dark? Victor claims the alien was sensitive to light. But there’s no doubt that the darkness would make it much easier for tricksters to pull off a hoax. All that can be clearly seen in much of the tape is the alien’s head. It could, after all, have been nothing more than an alien mask. Full body shots of the alien would have been much harder to pull off successfully. And why no audio track? Victor says he removed it to preserve the privacy of the people involved. But it would certainly have gone a long way to establishing the authenticity of the tape if we could hear what questions the alien was being asked and the answers it was giving. The converse is, of course, true. If the questions or answers sounded absurd and incongruous, it would be much easier to see through the fake. Some have questioned the actions of the medical personnel who rush in towards the end of the footage. They appear to handle the alien roughly, shining torches into its eyes, even though we have already been told it is sensitive to light. Victor’s response to this is that the medical staff on the base were not the best, being selected for discretion rather than competence. Ten years after it first surfaced, there is still no definitive proof about whether the alien interrogation video was genuine or faked. Certainly, unlike the Alien Autopsy film, no one has come forward claiming to be the author of the hoax. Opinions about the film are still sharply divided. Some judge it a laughable fraud; others are convinced it is real, and find it moving, even distressing, to watch. If your curiosity has been piqued, track the video down and decide for yourself.